Have you seen the BIG savings on the Weekly Deals this week from Stampin' Up?! These are HUGE savings your Christmas crafting needs for this year or even next year! 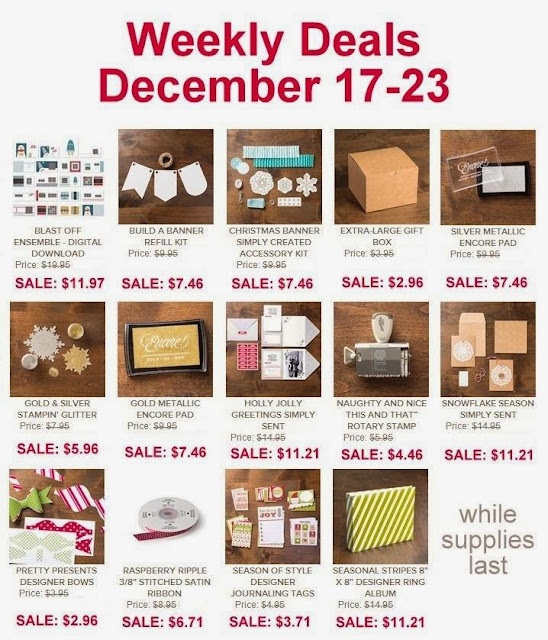 Also, if you are running short on time for Christmas shopping, I am also offering Stampin' Up! gift certificates. Certificates for Stampin’ Up! are available in any amount. Perfect for that “last minute” gift or even a stocking stuffer. Each e-Gift Certificate will be customized with your recipient’s name and greeting on it.